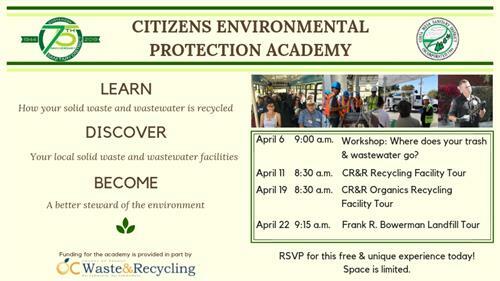 Presented through the Citizens Environmental Protection Academy, attendees will embark on a tour of Irvine's Bowerman Landfill, which features a multi-media presentation about Orange County's waste management system and a behind-the-scenes look at the waste disposal, green energy, and habitat restoration areas of the landfill. Attendees must be 5+ years old, per Orange County Waste & Recycling policy. Round-trip transportation will be provided from CMSD's headquarters (290 Paularino Avenue, Costa Mesa) to the landfill.